Why is Pet Safety Important? Here are a few facts you should be aware of whenever you consider traveling with your pets, whether by yourself or with your loved ones. In an accident, an unrestrained dog may be ejected or escape from the vehicle, resulting in the dog getting lost, injured or killed. 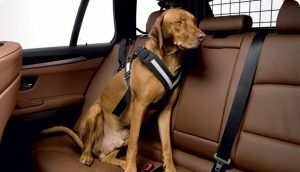 Why Crash Tested Pet Safety Products? It is always best to travel with your dog in a safe crate or harness whenever possible. In some states this is actually a law. If possible, traveling with a Crash Tested Dog Crate or Crash Tested Safety Harness is always best. It is extremely dangerous to travel with a harness or dog crate that does not meet crash safety standards. This is especially true when it come to rear end collisions for 2nd row passengers and children in child safety seats positioned in the 2nd row. Any harness, zip line, safety belt, wire crate, folding crate, plastic crate or any other pet safety travel product that is not Crash Tested may help avoid driver distraction, but they will not provide proper protection in the event of an accident. A dog crate that that is not crash tested can burst apart in a frontal impact, rear end collision or roll over accident. Your dog can be ejected or escape or be harmed by protruding shrapnel from a plastic or metal crate that has failed. Dog crates without a crumple zone can alter the crash safety features of your vehicle. Without crumple zone protection, everyone is at risk in a rear end collision. This is true when the crate is in your vehicle even without your dog in it. 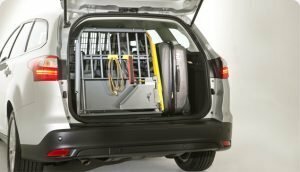 A properly engineered Crash Tested dog crate needs to absorb front, rear and rollover impacts while maintaining its integrity to keep the dog safely contained and avoid danger to human occupants in the vehicle. Crash Tested – Select a crate or harness that has been crash tested using Government Automotive Safety Standards. It is important to confirm that the cage or harness was tested using established criteria and published safety standards designed for a variety of real world accidents. For example, when choosing a crate, make sure it has been tested for front, rear and roll over impacts. Select a crate or harness that has been Crash Tested using Government Automotive Safety Standards for front, rear and roll over impacts. It is important to confirm that the cage or harness you choose was tested using established criteria and published safety standards designed to protect you, your family and your dog in the event of any type of accident. Safety Escape Hatch – Look for a safety escape hatch located at the rear of the crate. In the event of a rear end collision, your cargo door may not open. If this happens and you do not have an alternate exit, the crate will need to be cut apart to get your dog out. This can be very stressful and dangerous in a critical situation. Crumple Zone Protection – In the event of a collision, a solid cage without a crumple zone will alter the safety engineering of your vehicle by eliminating your vehicle’s built-in crash protection. This is true even with an empty crate left in your vehicle. In addition, the impact from a rear end collision applies tremendous force to the crate that can break or damage the rear seat causing serious or fatal injury to rear seat occupants. Your dog may also be impacted by the sharp edges of a broken crate that has not been engineered to absorb this tremendous force and energy. Last but not least, your dog may escape or be ejected from the broken crate through a broken window resulting in the dog getting lost, injured or killed. Crumple zone protection is required for the safety of everyone on board. Safety Record – Check with the manufacturer of any Crash Tested product and find out what Government Automotive Safety standards they meet. Look for products with a well-established track record of safety and a long history of proven results in real world accidents. Experience – Ask them about their experience and history related to the manufacturing of crash tested safety products. Check to see if the manufacturer uses automotive safety engineers to design their products and find out if they make other crash tested products for the automotive industry. Certifications – Request a copy of the manufacturer’s certifications, documentation and crash test videos to confirm their products meet the same strict guidelines required by the Automotive Industry required for vehicles and child car seats. Installation – Make sure you follow the manufacturer’s recommendations regarding assembly, installation and use of their Crash Tested products. Check to be sure that the manufacturer includes everything required for the proper installation and use of their products. Proper Use – Only use pet safety products in the exact same manner as they were tested. Using a pet safety product in any way that varies from the manufacturer’s recommendations may seriously alter the safety of the product. This will expose you and your loved ones to serious or fatal injury in the event of an accident. Customer Service – Do not hesitate to contact the manufacturer if you have questions or concerns. The manufacturer should be able to provide detailed information, documentation and answers to all of your questions and satisfy any questions or concerns you may have. According to a survey by the American Automobile Association, over 80% of dog owners’ drive with their pets in the car. There are 43.3 million households with pets so that’s an impressive number of people on the road with dogs in the car. Only 16% of people who transport their dogs use proper safety restraints. According to the National Highway Traffic Safety Administration (NHTSA) there were 5,687,000 crashes in 2013 with 1,591,000 injuries and 32,719 fatalities. Of that, there was an estimated 172,000 children injured in those traffic crashes. There is a good chance there were pets in these vehicles since 34.4 million American households drive with their pets. 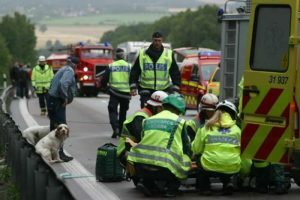 Over 80% of those pets were likely unrestrained, which means those pets were most likely injured, and at the very minimum, in shock. A full 51 percent of travelers with pets say they would bring their pets along on every vacation if they could, according to a recent AAA/Best Western survey. According to the National Safety Council, over 2.5 million rear end collisions are reported every year, making them the most common type of automobile accident. This is where most pets should be contained, which is why it is important to use crash tested pet safety products. According to the NHTSA there were 5,687,000 crashes in 2013 with 1,591,000 injuries and 32,719 fatalities. An estimated 172,000 children were injured in those traffic crashes. On average, 3 children were killed and an estimated 470 children were injured every day in the United States in those traffic crashes. Over 2.5 million rear end collisions are reported every year, making them the most common type of automobile accident. Rollover accidents kill more than 10,000 people each year in the United States. The rate of serious injury in passenger vehicle rollover crashes is 36 percent higher than in crashes where there is no rollover. Sports-Utility Vehicles fatalities account for 61% of all rollover fatalities. Almost 500,000 people in the United States suffer the effects of a spinal cord injury and there are around 10,000 new cases each year. 35% of spinal cord injuries are caused by automobile accidents, making car crashes the leading cause of spinal cord injuries. There are 43.3 million households with pets. 84% of dog owners traveling with their dogs are not restraining them. Only 16% of people who transport their dogs use proper safety restraints. 60% of dog owners have driven while distracted by their pets as passengers. 52% of dog owners have petted their dog while driving. 17% percent of drivers allowed their dog to sit in their lap while driving. 13% percent of drivers admitted to giving food or treats to their dog while driving. 4% percent of drivers acknowledged playing with their dog while driving. You owe it to yourself, your passengers and your beloved pet to make everyone’s journey as safe as possible.